You could go with Tardys suggestion, youll really truck upwind, eh tardy? a more sensible solution would be a 36 or 38 if youre after an upright fin. Youre 39 is probably not too far wrong. Unless youre having issues, id stick with that. have you tried that combo ?? Yeah I have used it, it works fine when powered up and get good speed. Wondering if a slightly bigger fin might be worthwhile in lighter winds. By a more "swept" fin you mean more freeride orientated? The 39cm fin is good for the 7.2m. I think a larger size would not be by much, 42cm as said . The smaller fin, would need to be SMALLER to handle the 7.2 when really windy, so 34cm would be my pick. 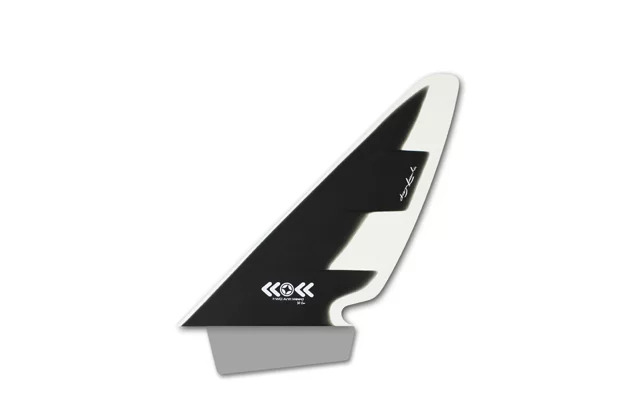 Using a small fin, will help with control issues when its windy, dont expect a miracle , as the board it self will be the the main factor. Considering your weight , the fin you have should be fine with the 7.2m . I would look for a used fin of not larger than 36-34. Comment-114 and 7.2 are the smallest and largest , I would think useable for you. Understood keeping to 1 board 1 sail. At some point a smaller sail will be useful. Short answer: what Tardy says. General advice that I've heard and seen (for example on James Douglas' gear calculator) is to go +2 cm in fin size for light wind, and -2 cm when really powered. From a PWA pro, I heard smaller differences - total fin size difference on the same board just 2 cm. But PWA pros usually change boards and sails up or down if the wind changes, and have 3 boards to use from. On my 110 l board which I mostly use for free riding, I sometimes go up 4 cm to plane in marginal conditions, and down 4 cm when well powered on flat water, for a total fin size range of 8 cm. If you can try fins from sailing buddies, that would be best. Not all fins are created equal, and you may find one that works better for you. While we are on the topic of fins, what would be a good size weed fin for this setup? Do weed fins need to be a bit bigger than a regular fin? 34 cm weed. This is the depth measurement but the actual fin length is greater hence you would go smaller in the weed fins. The fin area could come in the weed fin equation. Richard G, response is good. I dont much like weed fins, but I use them where necessary. I think a better quality one, helps, the parts I dont like. If availabe Makani fins, from Canada do a nice job at a moderate price, but CNC Fins in Niorth Carolina are the bomb. makani now has a tumble weed custom carbon for slalom and this is behond what i ever used before!! Serious weed lovers must considered that new fin from them!